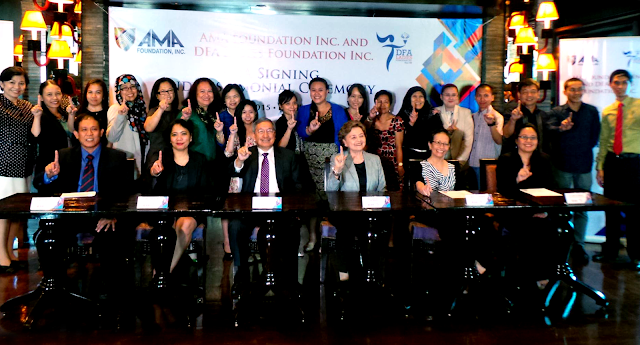 AMA Group of Companies through its Corporate Social Responsibility arm AMA Foundation, recently renewed its partnership with the DFA Ladies Foundation Inc. (DFALF), as part of its initiatives in providing educational support to financially-challenged and deserving individuals who aspire to pursue higher education. The agreement signing took place at Buddha Bar Manila, a world-class bar, lounge and restaurant in Makati City. DFA Ladies Foundation (DFALF) was represented by its Chairperson, Madame Margaret Gretchen V. Del Rosario, while AMA Group of Companies was represented by none other than its Chairman, Dr. Amable R. Aguiluz V.
Under the partnership, AMA Group of Companies through its educational institution network, AMA Education System, will accept scholars that will be endorsed by DFALF to its degree and technical courses. AMA Education System is the organization that manages and operates AMA University, AMA Computer College, ACLC College, AMA Computer Learning Center, St. Augustine School of Nursing and Delta Air International Aviation Academy. During the MOA signing ceremony, 6 beneficiaries of the scholarship program, namely Edwin Ramos - NCR, Marissa Flores - NCR, Roy Namocot - NCR, Maria Karla Joy Cruz - NCR, Mohamad Bolkiah R. Batu-an – Lanao del Sur, Nilo Palaya – NCR, were given the opportunity to share their testimonies on how the program has helped them fulfill their dreams and achieve more in life. Nilo Palaya is just one of the individuals whose life was improved through the scholarship program that was established by AMA Foundation and DFA Ladies Foundation Inc. out of the shared goal and advocacy to make education more available, more affordable and more accessible, so people can land jobs to help themselves and their families. Indeed, the partnership between AMA Foundation and DFA Ladies Foundation is more than just another corporate social responsibility program, but a blessing to everyone who aims to better themselves through education.